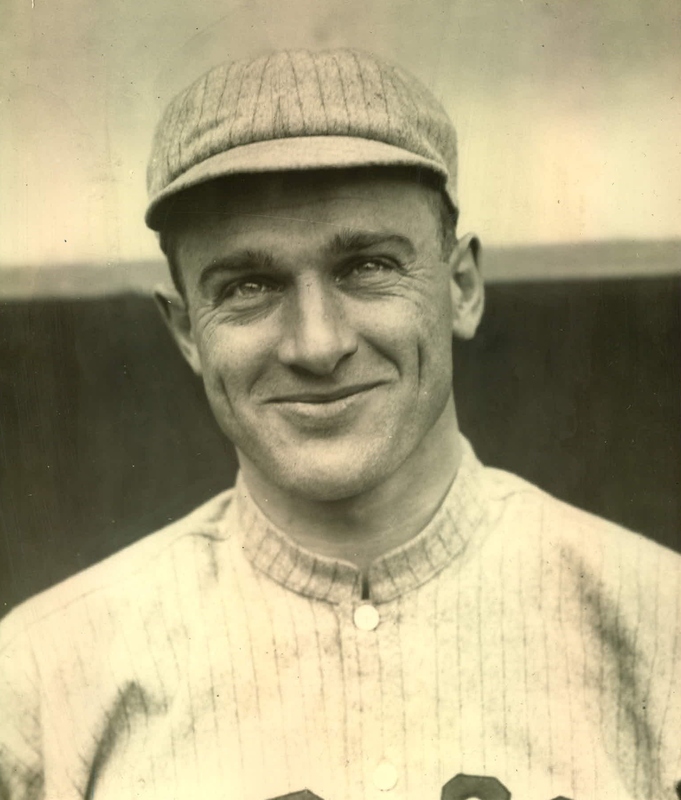 ← Now Batting for the 1912 Boston Red Sox, the Second Baseman, Steve Yerkes…..
Drumroll please while I introduce to you the last regular in the Red Sox lineup of 1912, Mr. William Lawrence “Larry” Gardner. Larry Gardner, one of five native New Englander’s on Fenway’s first Red Sox squad, was a teammate of pitcher Ray Collins at the University of Vermont. He is widely recognized as the greatest major league player the state of Vermont has ever produced. He joined the Red Sox in 1908, foregoing his final year of college eligibility and by 1910 he had worked his way into the starting lineup at second base. Moving over to third, in 1911, Gardner was penciled in at third base by four different managers, for the next seven years, averaging 141 games per season. 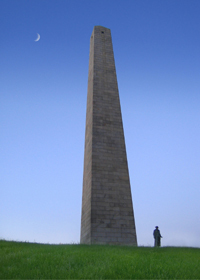 Bunker Hill Monument, Charlestown Massachusetts. 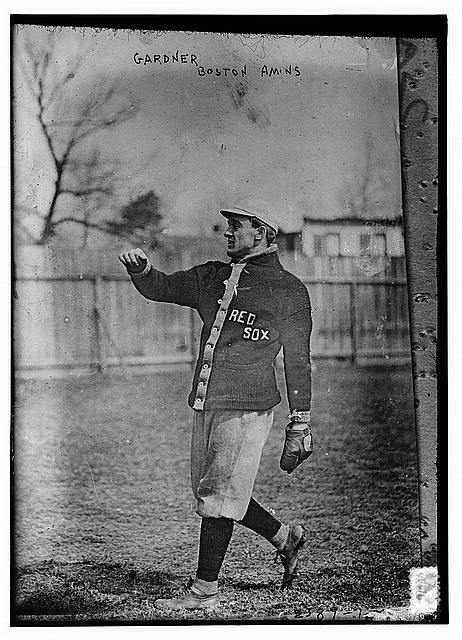 His breakout year came in Fenway’s inaugural season of 1912. Hitting fifth in the lineup, he batted .315 with 86 RBI, 88 runs scored, 25 stolen bases and a team leading 18 triples. All this while playing a solid third base. 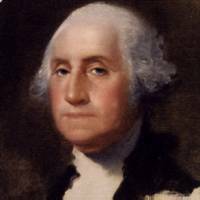 Baseball Magazine named him the 1912 first team third baseman or as they referred to it, the All American third baseman. Rooming with his best friend and teammate, Harry Hooper throughout the year, in the north shore town of Winthrop, the teammates would commute to Fenway Park in their brand spanking new Stutz Roadster. 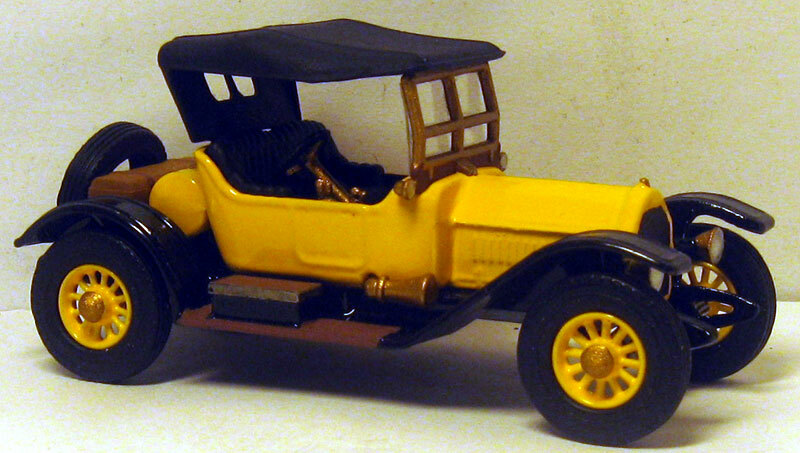 Gardner and Hooper co-owned this four-cylinder beauty and road to Fenway in style all season. 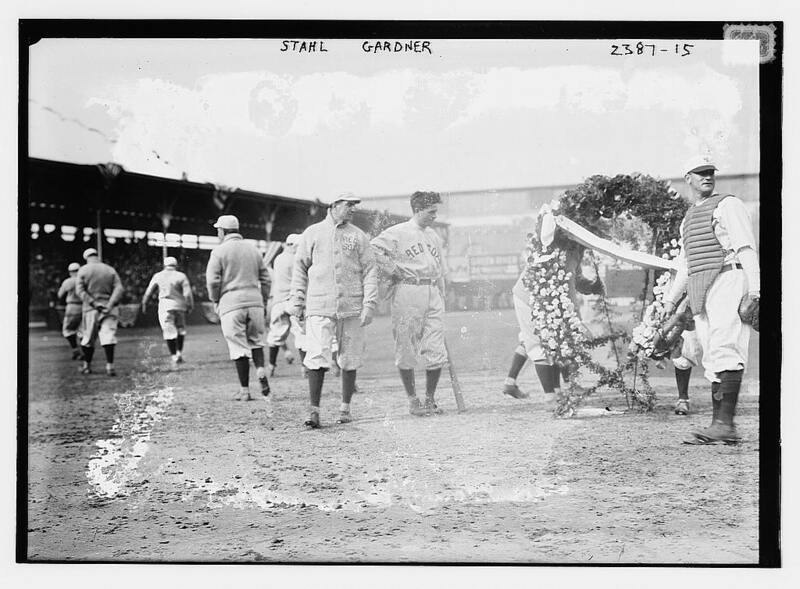 The Red Sox ran away from the field in 1912, winning the pennant by 14 games over the second place Washington Senators and in a meaningless game in late September against the Tigers, Gardner dove for a hot-shot hit to his right. He attempted to bare hand the ball which smashed his baby finger, causing the bone to break through the skin. Todays medical parlance would refer to that as a compound fracture. 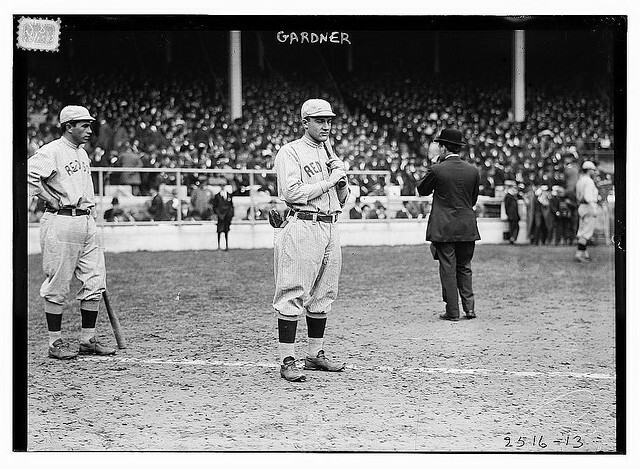 Larry Gardner, leaning on the bat, before a game in the 1912 World Series at the Polo Grounds. On the left, manager Jake Stahl. Larry headed home to Vermont to recuperate and it was thought he would be out of the World Series, but he would have none of it. Playing with the last two fingers on his right hand taped together, he struggled with the bat hitting only .179 for the Series. However, in the fourth game he had a single and a triple and scored two of the three runs in a 3-1 victory. And with the entire World Series on the line, in the final game, it was Larry Gardner who delivered. 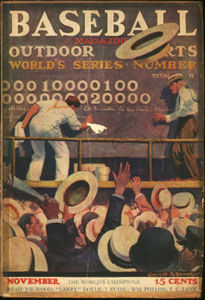 The game was tied with the bases loaded in the bottom of the 10th, and there was one out, Gardner launched a Christy Mathewson offering to deep right field which plated Steve Yerkes with the winning World Series run, capping Fenway Park’s inaugural season with a World Championship. He was part of two more Fenway World Championships before being traded after the 1917 season. Retiring in 1924 after 17 years of baseball, he went home to Vermont and opened a car dealership. In 1929 he was named coach of the University of Vermont team, a position he held until 1951. Larry Gardner passed away in 1976, two months short of his 90th birthday. Ten years later his beloved University of Vermont team wore commemorative patches honoring his 100th birthday. 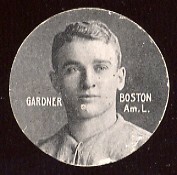 And so it was at this time in Fenway Park history, 1912-1917, Larry Gardner’s time. This entry was posted in Fenway Park Baseball and tagged 1912, Christy Mathewson, Fenway Park, Harry Hooper, Larry Gardner, Ray Collins, Red Sox, Stutz Roadster, University of Vermont. Bookmark the permalink.